I know it's been a very long time since I last posted here on my blog, not even sure how many people still subscribe but here goes :) ...As some of you already may know I took a bit of a break, this past year has been a tough one, I was diagnosed with endometrial cancer and had numerous heart conditions to deal with, added to that I found out my Dad has colon cancer as well. We're getting through this though, as for me I'm doing a lot better but am on a waiting list for a procedure for my atrial fibrillation. 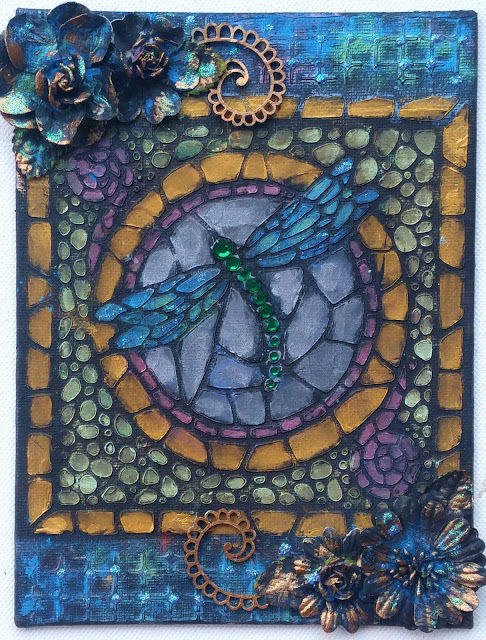 Enough about me though, I recently have been intrigued by alcohol ink on Yupo paper. So many have asked that I do a tutorial on products I use to make my artwork and a little watch the process video, hopefully the above tutorial will be helpful to you! I began being interested in fluid art over a year ago (acrylic pours etc.) but never followed through with giving it a try. But when I saw this alcohol ink on Yupo paper (not really paper but more of a plastic sheet), I saw how little investment it took and really not a lot of mess either. So I thought I'd give it a try! It's so much fun to do! Hello friends! I have a new page kit to share with you that is filled with lotsa fun chipboard and some unique and beautiful embellishments. And as always you get a unlimited access to a private video tutorial on how to make this page when you order from The Scrapbook Diaries! There is an amazing set of chipboard designs included in this kit, I think all these circles and cogs allow for a variety of designs, here I used it like a spray across the page....I love these combo packs because they allow for a maximum variety of chipboard designs for a minimum price! Also included are those lovely title chippies, I really love the font used on these. I began the design by relaxing and (watching TV) while cutting out a bunch of these cute little butterflies from a lovely contact sheet by LemonCraft. And I combined the butterflies with these cute adhesive buttons by LemonCraft. 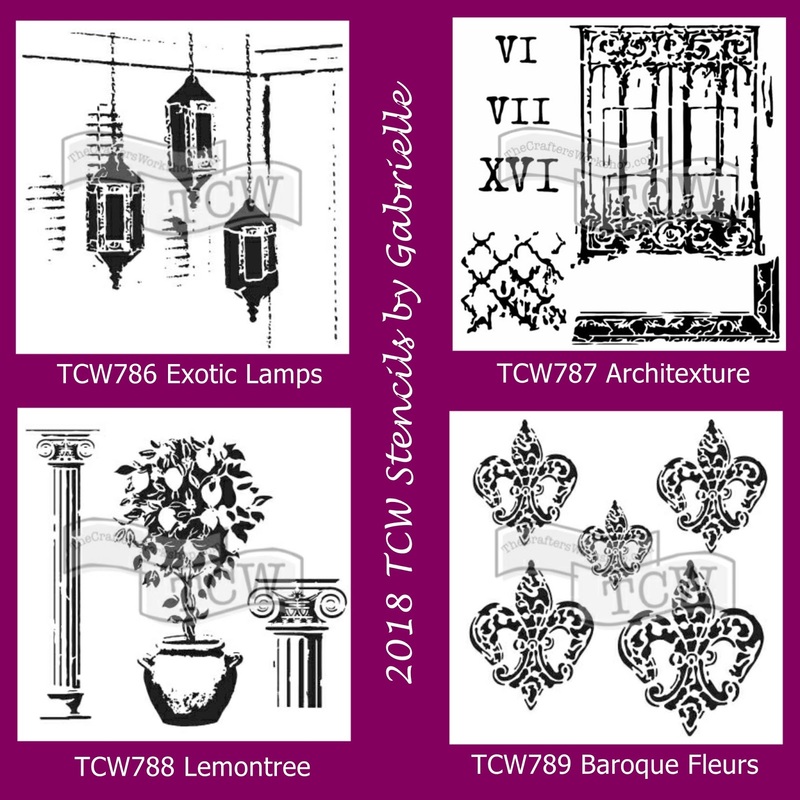 The chickenwire is this cool set of stickers by 7 Gypsies. I just randomly cut the sticker to suit my design. 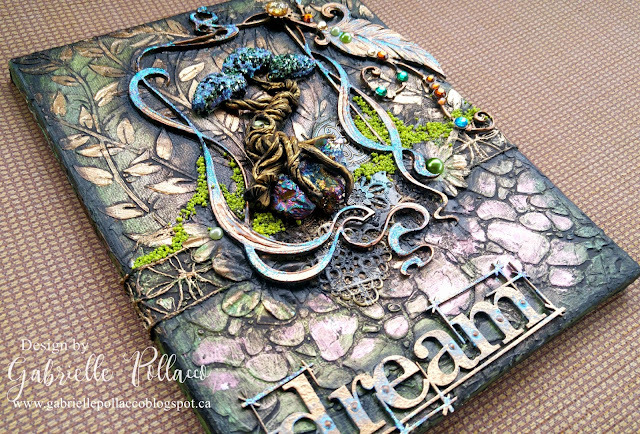 I had been saving this stunning packet of verdigris metal leaves by Prima for just the right kit and here I finally found it! Aren't these embellishments beautiful? ...of course Janene had stock-piled enough of them so that I could create a kit with them. 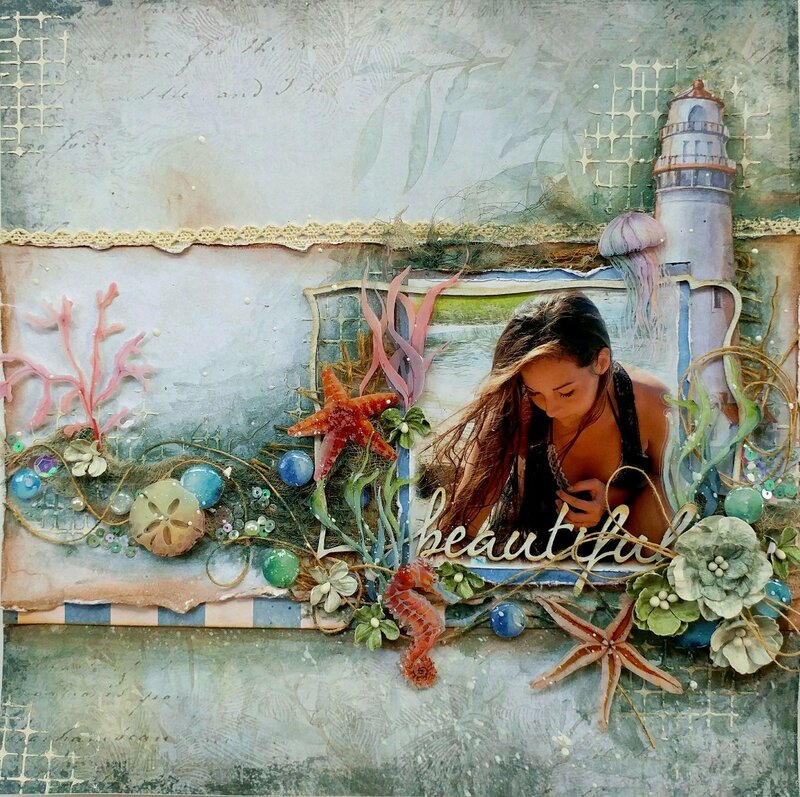 And as always I love to add in some cool mixed media products, here I used a Tim Holtz paint called Sea Glass and some of my favorite Prills pebbles as well....all of course are included in the kit. The beauty of this kit is it works equally well for a girlish page or a masculine page....and the title allows for so many photos. 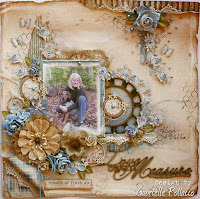 Janene includes enough product to make bonus pages and you can see a sample she made at The Scrapbook Diaries website. 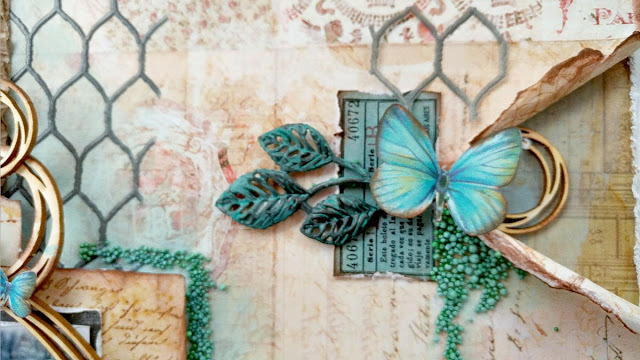 Some of these kits are limited because of some of the unique products I use on the page such as the metal verdigris leaves, so if this one appeals to you, head on over to the Scrapbook Diaries before she runs out! You can order you kit HERE. Hello friends! 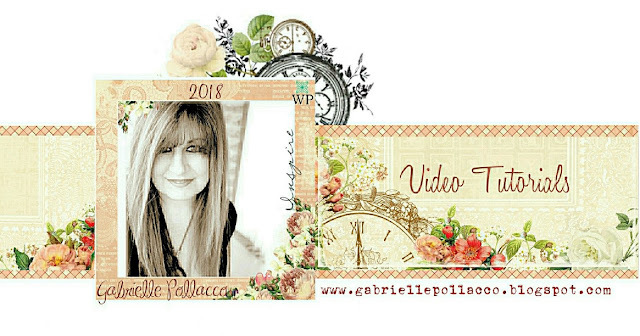 I'm back with a NEW video tutorial....well, sort of, LOL, I made this travel journal last year using some fun stencils I designed for The Crafter's Workshop (TCW). I had said I would come out with a video tutorial for it but took forever to get it done. My only explanation is that it's been one crazy busy and hectic year. Along with my oldest daughter getting married, I also have been dealing with some health issues. I have AFIB (Atrial Fibrillation) and recently has been getting worse and worse. I'm under a cardiologists care now (after having had to undergo cardioversion twice! to bring my heart back to a normal sinus rhythm), so hopefully I will get things sorted out and get back to normal living again! This is a head on view of the journal. 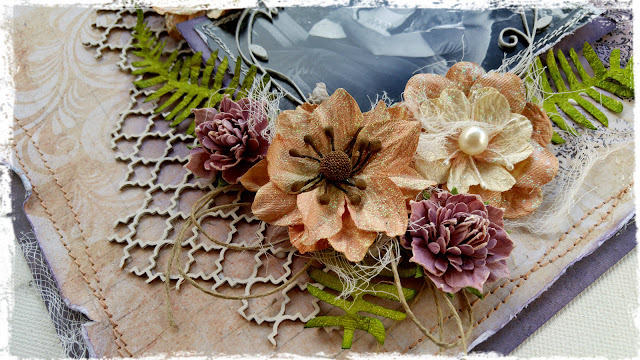 I bought my base for this at our local dollar store, I always keep a lookout for fun things to make-over using mixed media products and this one is inexpensive and works beautifully for my purposes. 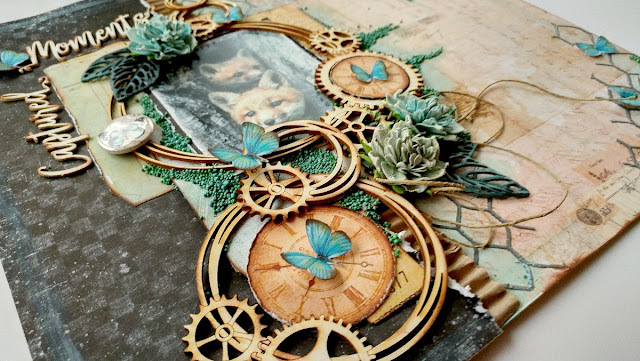 I kept the centerpiece very simple for this one...I only used a couple of chipboard cogs by Dusty Attic and a square piece of chipboard (I think it was an inside throw-away piece from a window) and used the stencils to get creative. 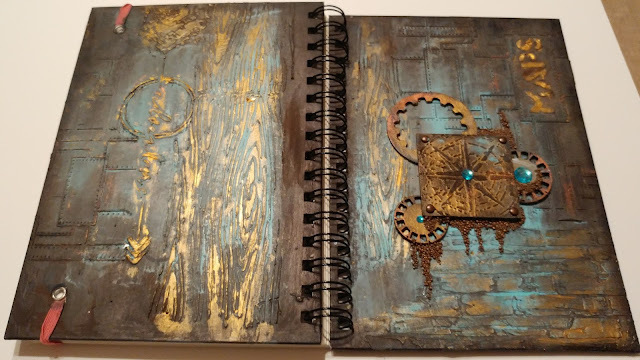 This is a pic of the front and backside of the journal. Although I made a full tutorial, you can of course create the background using your own creative style. As I'm sharing this video tutorial (finally! )....I have some NEW news! 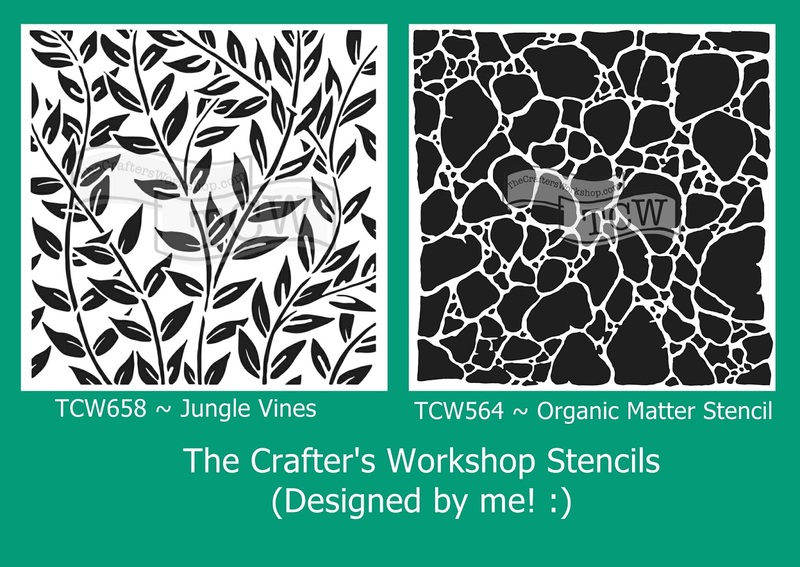 I have designed 4 new stencils for The Crafters Workshop which are being released this weekend at the Creativation show in Arizona! Here is a little peek at the new stencils....Hope you like!! Hi Everyone! I know it's been ages since I last posted! 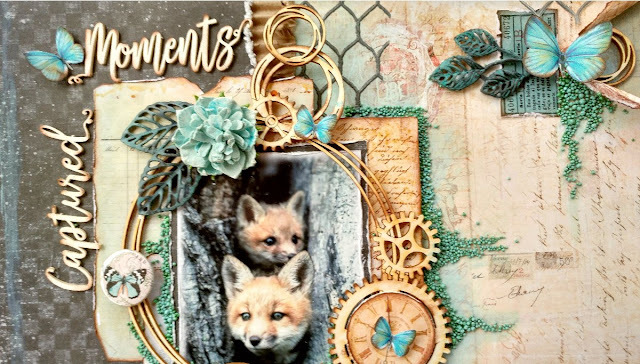 My dear friend Janene at The Scrapbook Diaries has been gently reminding me there are many out there that are wanting some fun new kit pages....so here I am with a kit page using some amazing products from great companies like 49 & Market, LemonCraft and Prima. I've been busy making up a photobook from all the beautiful photo's we got from my daughter Chloe's wedding. 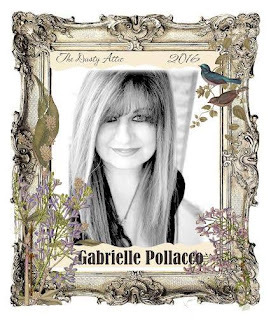 This is one of my favorite photo's taken by a dear friend of ours (Gord Wenzel, an amazing photographer) ....he captured this sweet unposed photo of her that I think expresses her beautiful soul. I really love the papers I was able to use for this kit....so feminine and beautiful....I used this for a wedding photo but it can be used equally well for friendship pages or any other themed page you're looking to make up. 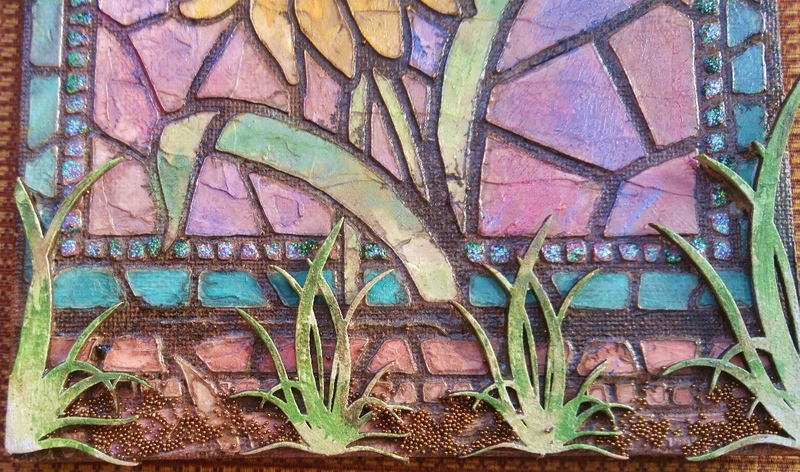 I always love to add in those little extra's like Prills (the small colorful pearls) that add a lovely texture to the page. 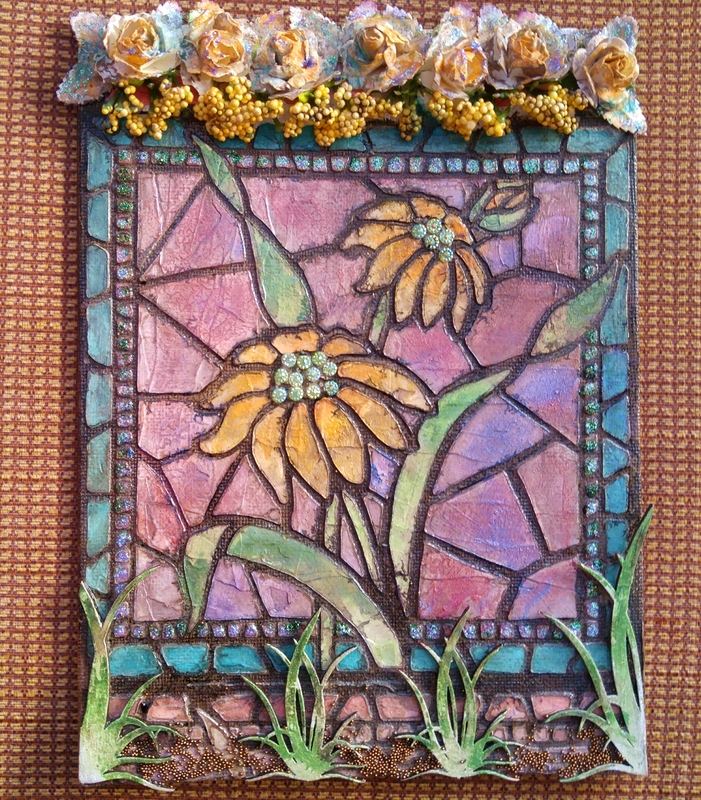 And the flowers and chipboard accents! Beautiful shimmery goodness by 49 and Market. 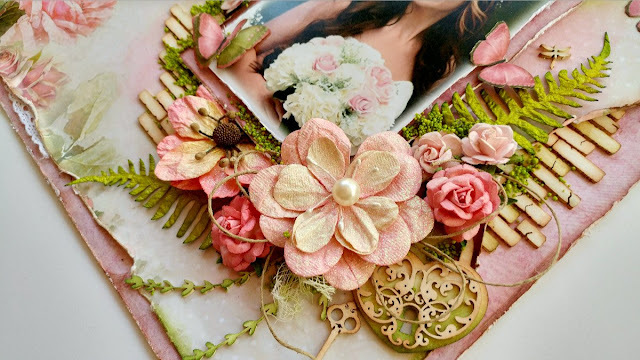 Janene Meyerowitz cleverly designed these groupings of chipboard that allow you to have a nice variety of chipboard for your page without breaking the bank! As always the kit comes with a free unlimited access to a private Video Tutorial, which will show you step by step how to make this page as well as all the materials and mixed media products to create this page and bonus pages. NEW! 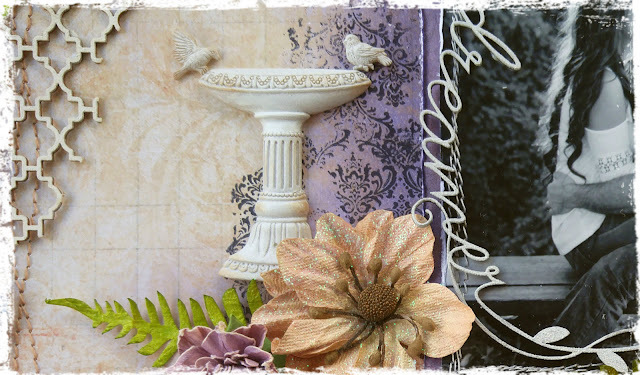 Kit & Video Tutorial for The Scrapbook Diaries! 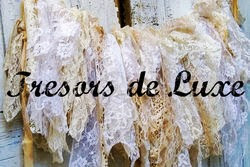 Hello dear friends, I know it has been quite some time since I last posted on my blog. As most of you know I've had a lot going on with my daughters wedding....but it is done now (it was a beautiful wedding) and now I have time to get back to my creative work! 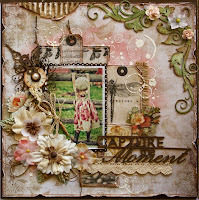 My first order of business was to get a new Page Kit done for The Scrapbook Diaries! It's summer and it's such a fun time to do those beach/seaside photo's. 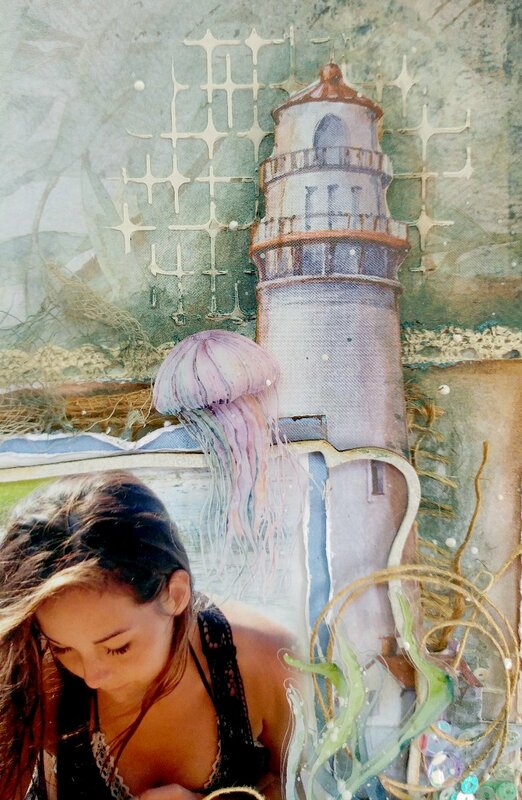 I used the gorgeous papers and embellishments from the new 49 & Market collection (designed by Janene Meyerowitz) called Sand & Sea! 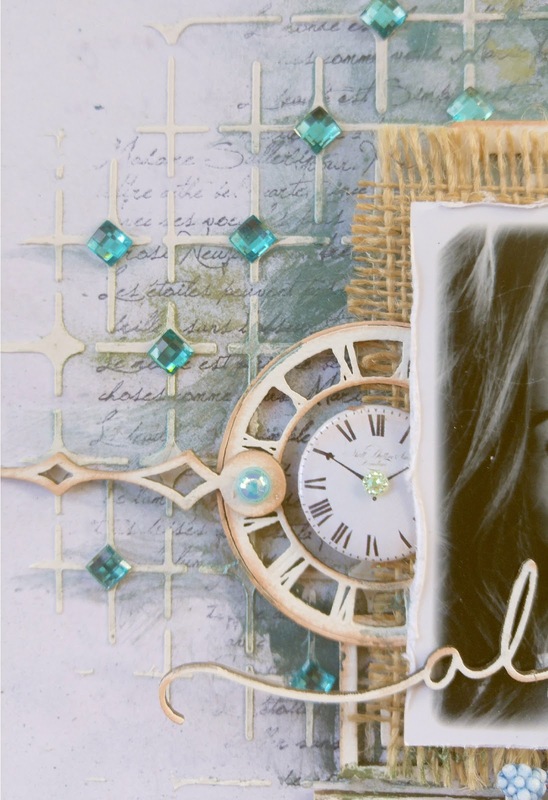 I am so in love with these papers and especially the layered sticker sheet that goes with it!! These beautiful layered stickers (sea horses, shells, starfish, bubbles, coral, sea grass and jellyfish) are so pretty and add a lovely 3D effect....and best of all, no fussy cutting! 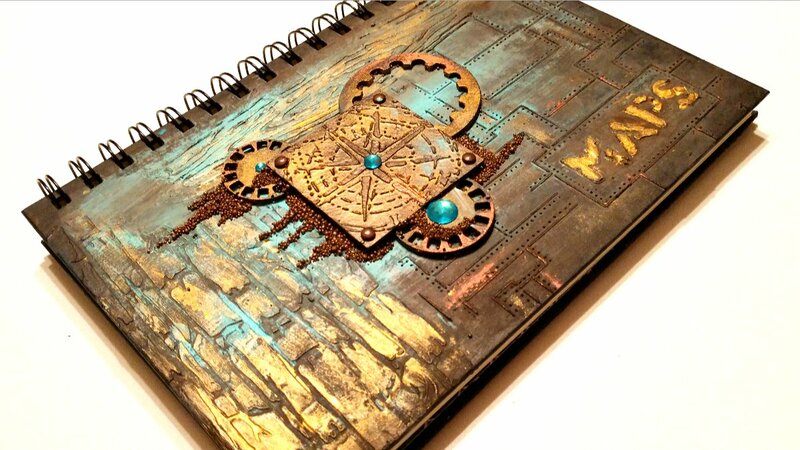 In an instant you have the look of a page that took a lot of time and detailing but without all the work! 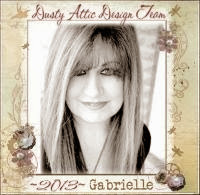 Included in this kit is a full 12x12 layered translucent sticker sheet with glitter accents....I'm actually hoarding some for a canvas I want to do....but there are a LOT of embellishments to choose from in this package....and lets just say the quantity is limited on these so you may want to jump in on this one asap! 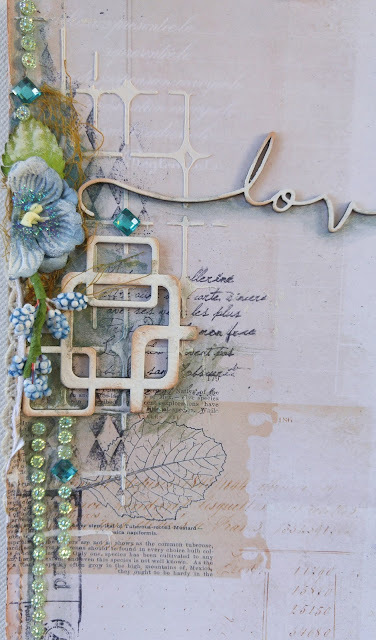 For this kit page I used a cool distress crayon by Tim Holtz along with some gorgeous Blue Patina mica powder by Ranger Perfect Pearls for my mixed media products (included in the kit of course). And to give the page some lovely texture I used a 6x6 stencil that I designed for The Crafter's Workshop called Tile Mania (TCW662).....all included in the kit. As always the kit includes a full private video tutorial to which you will have unlimited access to with the purchase of the kit. 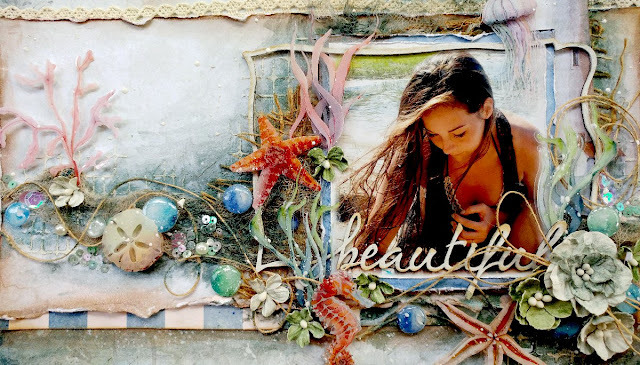 This will show you in step by step detail how to create this page. You can imitate it exactly as is or tweak it to match your own taste. 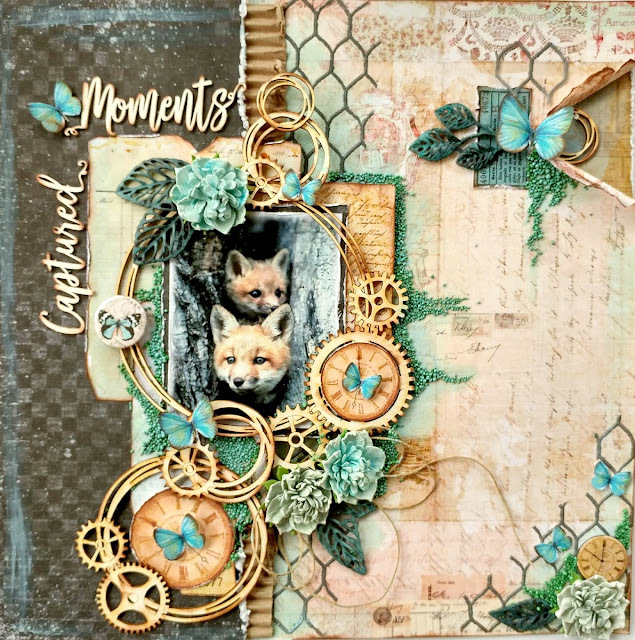 Janene also created a bonus page that can be made with this kit and let me tell you it's a stunner, it utilizes some more of my favorite papers from the gorgeous Sand & Sea collection! 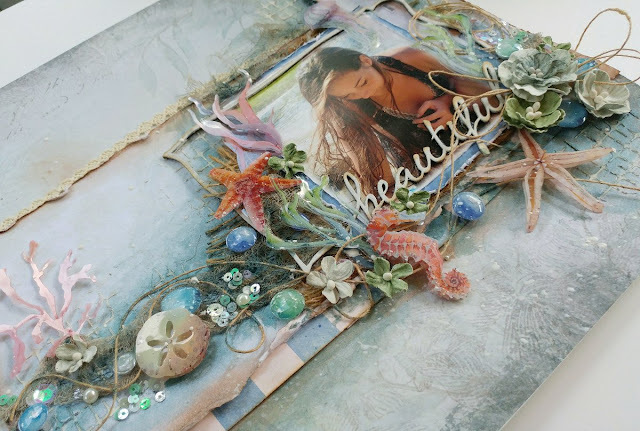 I have to admit that beach/summer pages are my favorite to create and this one was seriously fun to play with, I think you will really enjoy this one. 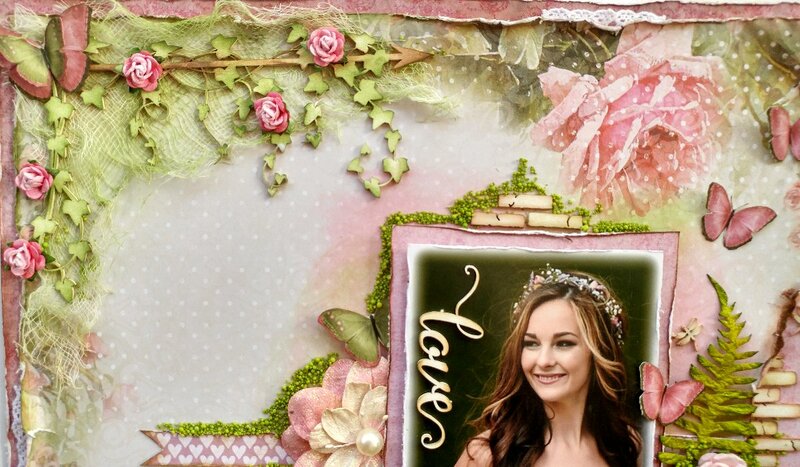 You can get your kit while quantities last at The Scrapbook Diaries HERE. 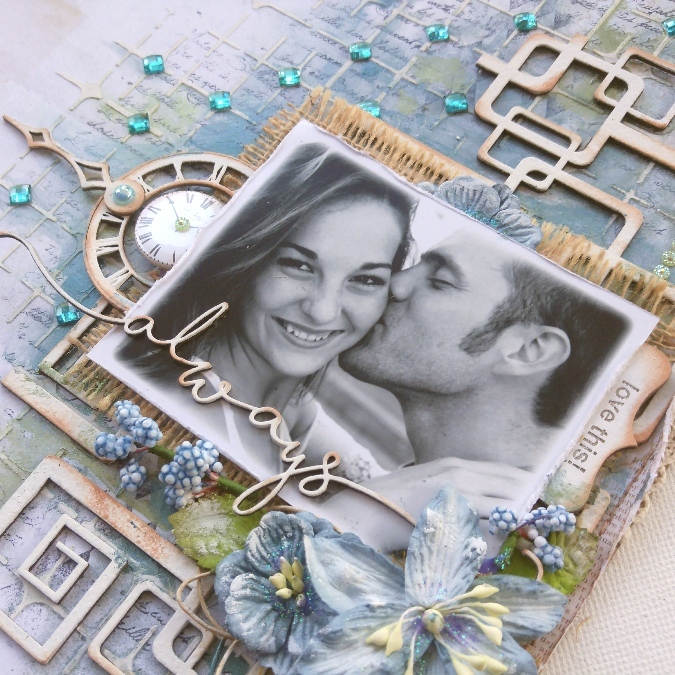 I hope you enjoyed this post today and perhaps want to give this gorgeous kit a go! 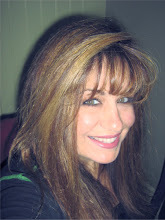 I appreciate all your kind comments and feedback and read and reply to them all! Thanks so much! 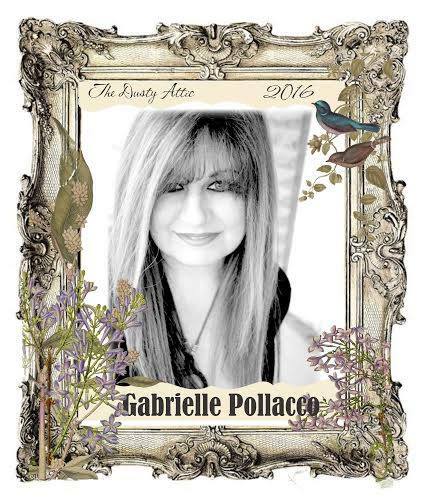 Have a lovely creative weekend my friends! Hi All! I have a new fun and easy Video Tutorial up today again this time using the NEW Winged Mosaic TCW656 stencil that I designed for The Crafter's Workshop! 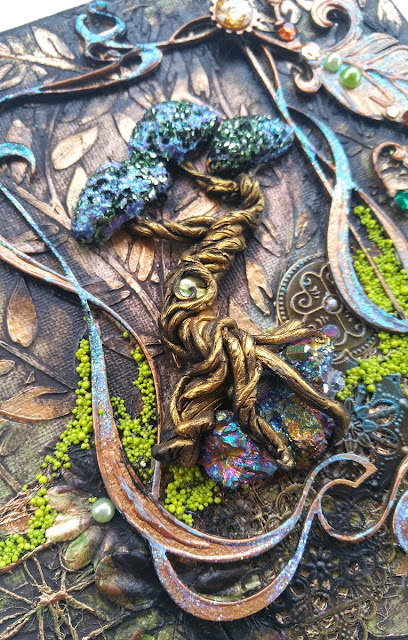 I gave you all a peek at this one a few weeks back and here today I have a full video tutorial on how it was made :) ....so grab a cuppa, kick up the feet, relax and enjoy! Hope you all enjoyed my little tutorial! Just imagine all the fun ways you can use a mosaic tile stencil! On a keepsake box, on the cover of an art journal....the projects are endless! And all the work of piecing together a mosaic is already done for you! 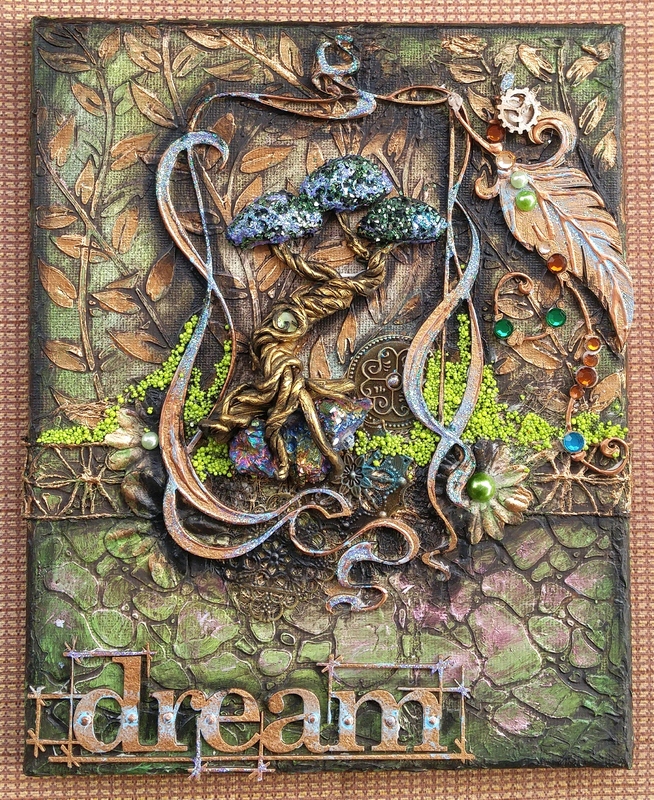 And the look of it of course will change with the mixed media products you choose to use on the stencil! I used TCW Black Gesso and Black Modeling paste with Pearlex Mica Powders, then sealed it with some hair spray. 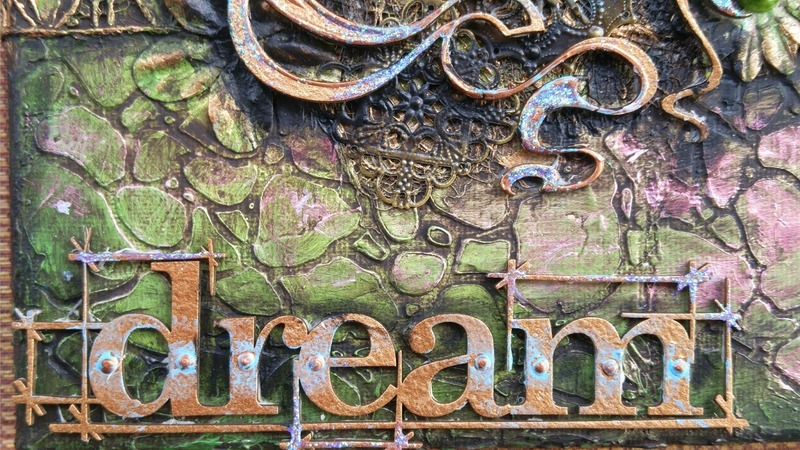 I can't wait to see how you all use this stencil in your projects! 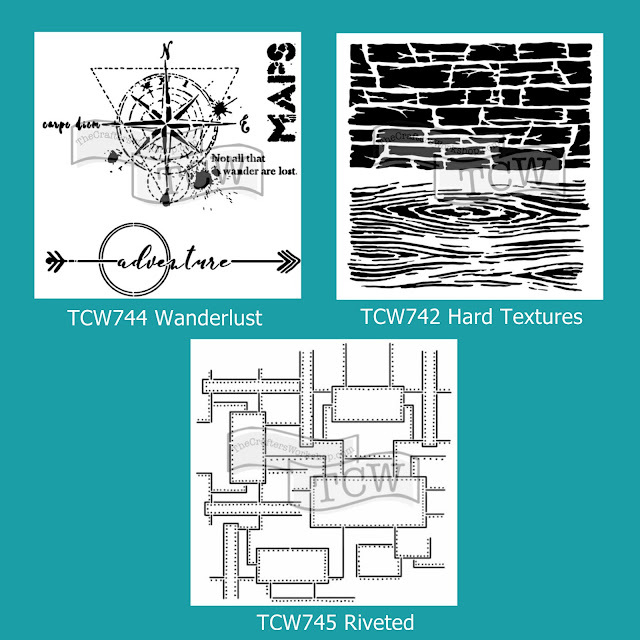 The good news is that TCW is carried by a lot of craft stores so it shouldn't be hard to find one near you. 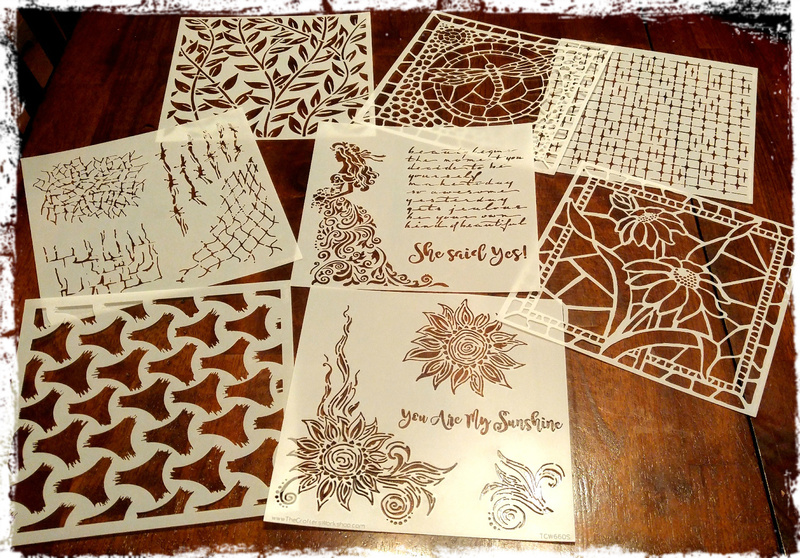 If you are looking to order online I know that Janene at The Scrapbook Diaries has my stencils in, in both sizes (for Canada and USA, she ships international as well), The Mad Scrapper in the UK, and Scrapbook.com has it as well! NEW! Kit & Video for The Scrapbook Diaries!! 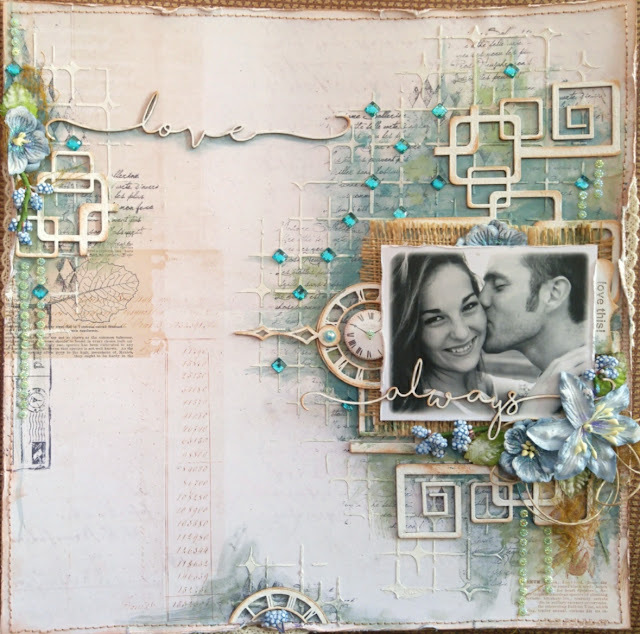 There are so many fun page elements in this kit, I really had a lot of fun working with these! Loads of gorgeous blooms from 49 and Market (these are so shimmery and lovely, the photo doesn't do them justice! 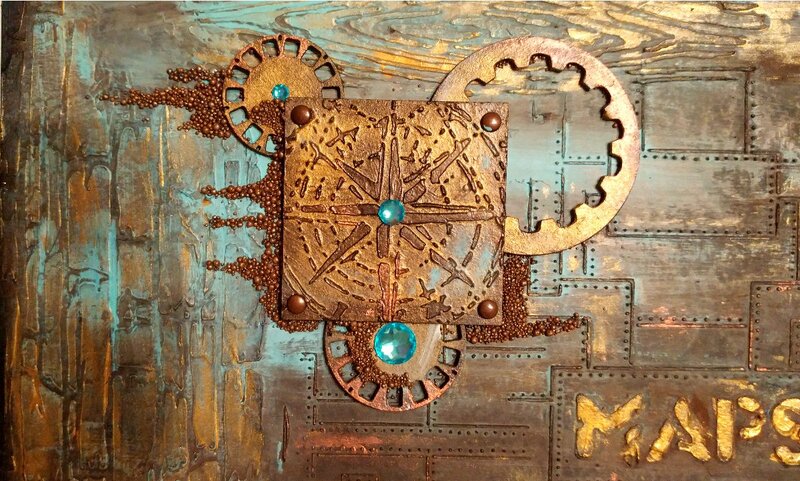 )....and really beautiful chipboard accents). As always, the kit includes everything in it so that you can recreate the page I made here (including unlimited access to a full private video tutorial on how to make the page)....a lovely shade of Tim Holtz Distress Ink, one of my new stamp designs (Faded Damask), lots of chipboard and beautiful shabby chic Prima accents. People often say to me, 'you get to work with such beautiful products! '.....well, you can too! 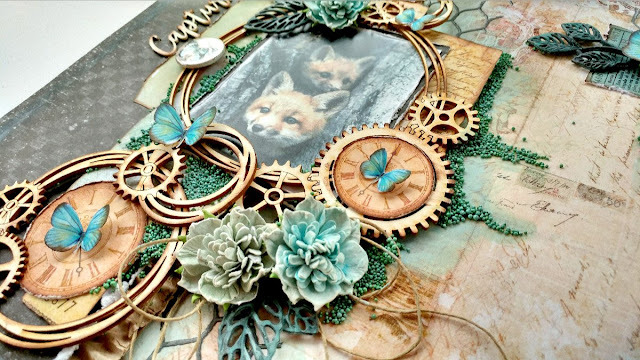 Everything you need is put together in this kit along with full instructions and plenty to make a bonus page and more! I just love the colors in this kit, I find them soothing and appealing to the eye. 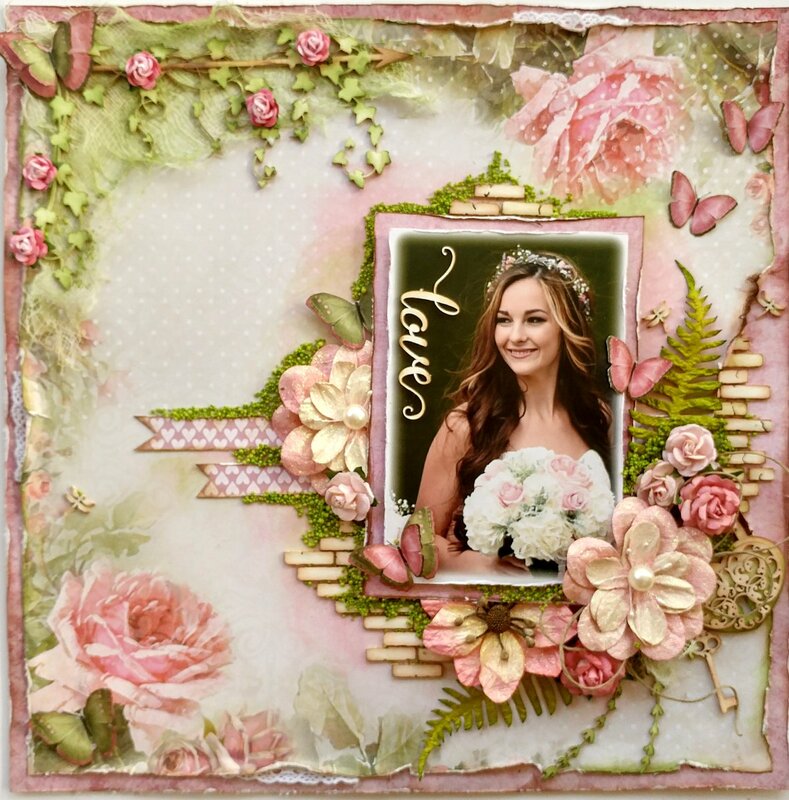 You can order this kit (while they last) at The Scrapbook Diaries HERE. As for me? 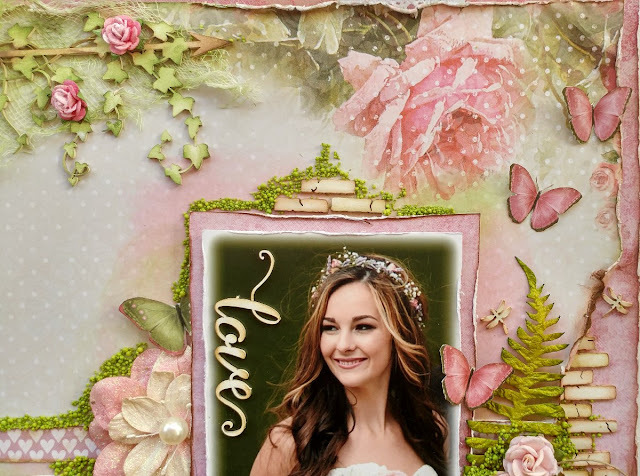 Back to the fun of wedding planning for my sweet daughter and her fiancee ......I'm a bit OCD so I take on a lot of things myself....is it crazy that I want to do the wedding cake, the flowers, the sweet table, the decorating? Hey, at least I'm leaving the catering for the dinner to someone else, LOL! The photo is of my oldest daughter and her fiancee, they are getting married in May and this photo was one of my many favorites from their engagement photo shoot. Another little closeup of the accent area on my layout....I like to throw a little accent area in to balance the page design. 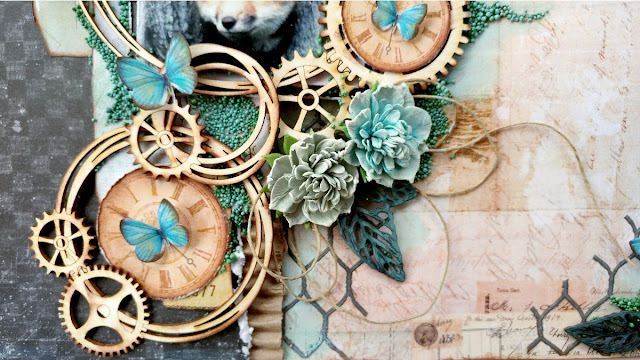 The little blue buds were part of a kit I made up for The Scrapbook Diaries a little while back. If Janene doesn't have these in her store, I know that many craft stores carry these or something similar in a variety of colors. I hope you guys enjoyed watching this video tutorial and weren't too put off by my voice! lol......now I've got to get back to wedding plans, like a true mom I've decided to take on a lot of the work myself....wedding cake, flower arranging, decorating....yipes! 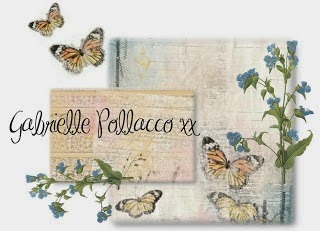 Thanks for stopping by my blog today and thanks for the kind comments you all are always leaving me, I really appreciate it! For this project I used the stencil I designed for The Crafters Workshop called 'Stained Glass Daisies' TCW657. The photo you see above is an extra canvas I made using acrylic paints. 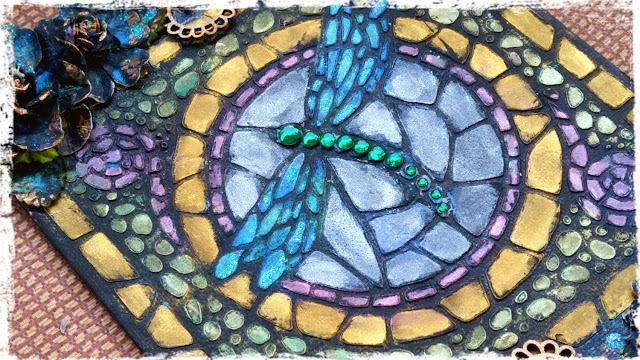 But in the following video tutorial I used a variety of Shimmerz Paints Products to create my Mosaic canvas. Time to grab yourself a cup of coffee (or tea), kick back, relax and enjoy! Hope you enjoyed my little tutorial....and easy, right? Almost like painting in a coloring book! And you get a mosaic effect without having to cut and match pieces, it's all done for you, just a few swipes with some texture paste and your can get your creative on with coloring! 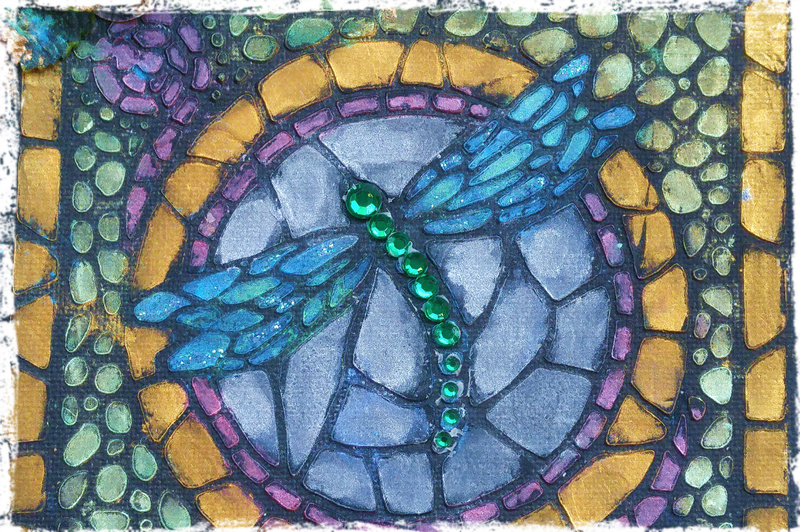 This is a still shot of the stencil I created in the video tutorial using the Shimmerz paints, here I used a wash in the 'grout' lines, giving more of a vintage look. 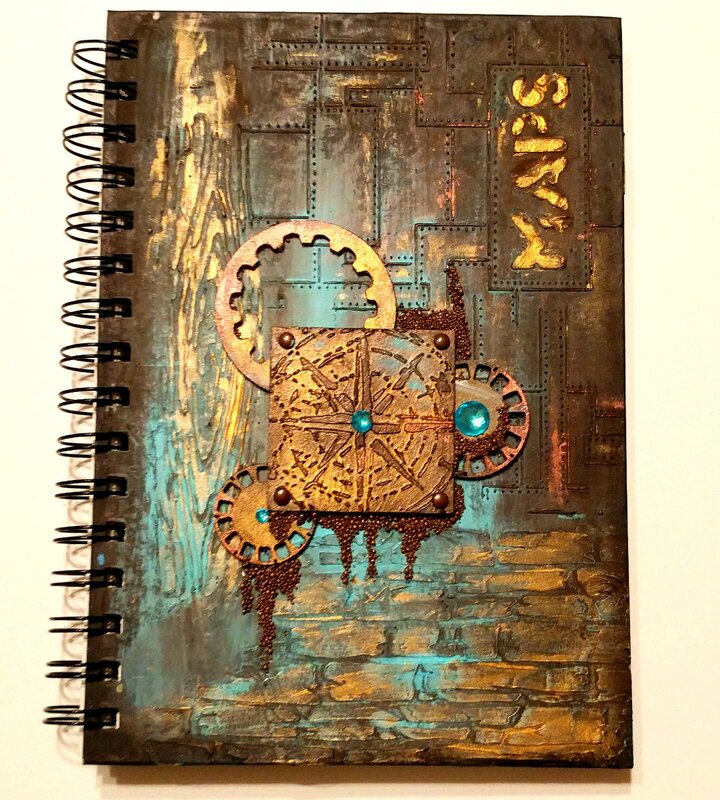 For the canvas at the top of this blog I simply used TCW's Black Gesso for the background and TCW's Ultra Thick Molding Paste for the stencil and then painted with some favorite acrylic paint colors. 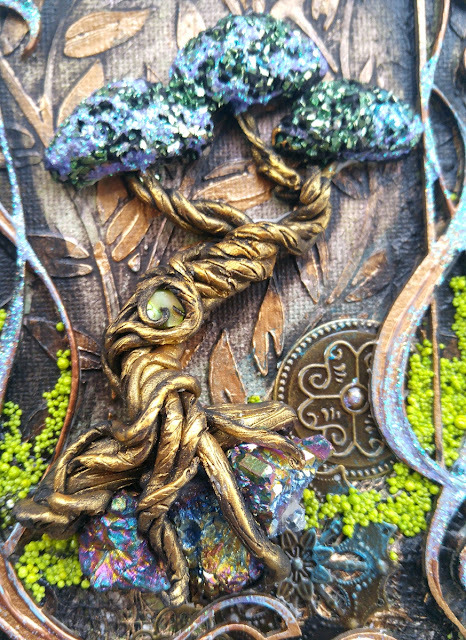 But Getting back to the canvas in the video....I used a variety of Shimmerz Paints products for this one and finished the design by adding some Dusty Attic Grasses at the bottom of the canvas. You can pick up your Shimmerz Paints HERE. NOTE: Be sure to mention my name 'Gabrielle' in your next order to receive a FREE/Bonus Shimmerz Paints product in the color of your choice! 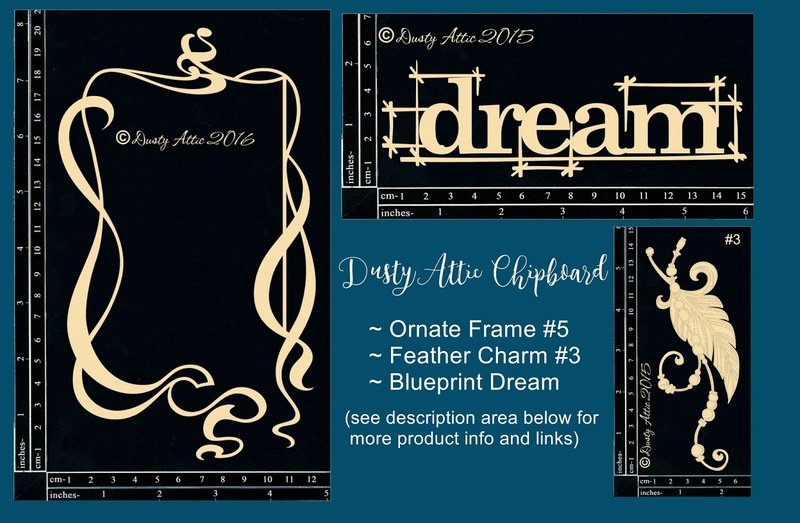 I also used a few of my favorite Dusty Attic chipboard pieces, a fairly new frame called Ornate Frame #5 and another called Feathered Charm #3...and a very cool title chippie called Blueprint Dream. This video tutorial is a 2 parter which includes a small tutorial on how I made the polymer clay Bonsai Tree center piece so it's a few minutes longer than my usual tutorials. Hope you all enjoy! 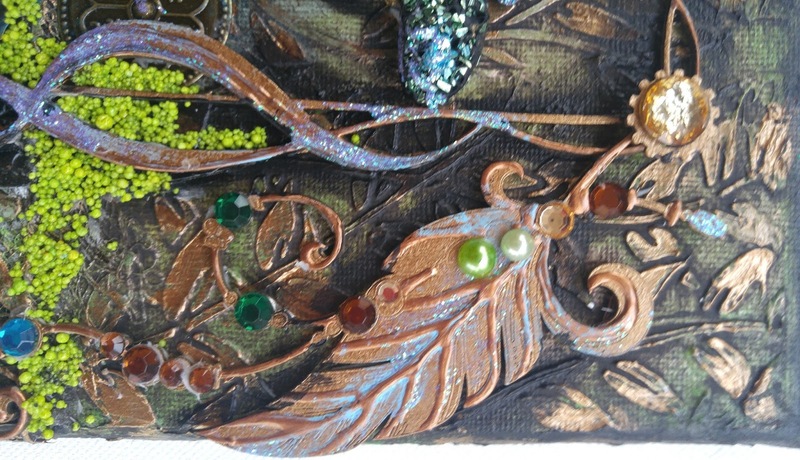 This was a really fun canvas to do and I hope you all give it (or something like it) a try!The tree center piece was easy to make and the result is something that to me resembles something that looks like cast bronze! 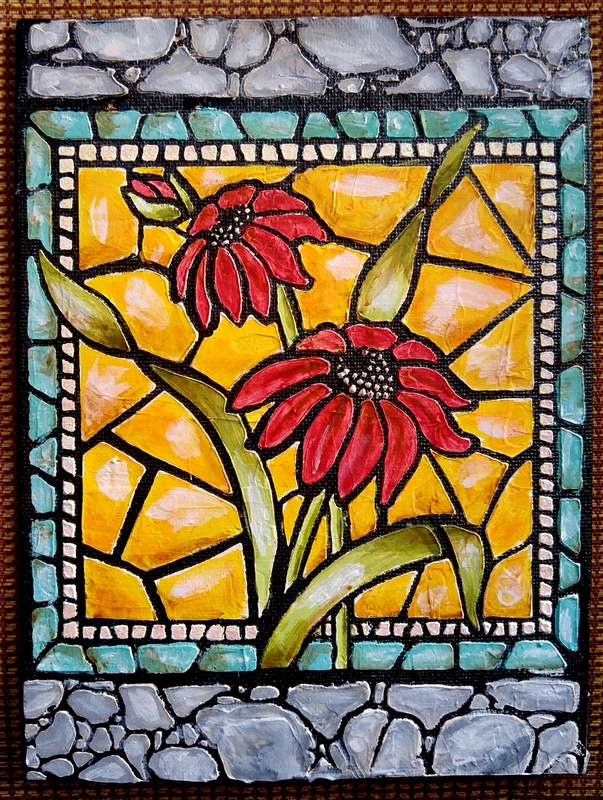 And how fun is that flourishy art deco looking frame? for this I used a variety of metalic paints and glitter glue. (All the products are listed in the description area under the Youtube video). I used Sculpey polymer clay to make the tree and with a few easy steps, you can make it too. I like to take the time to use the tip of a knife to put in a few etching lines in the 'bark', this shows up well when you add the Pearlex mica powder before you bake off the piece. Here's a close up of the title chippie by Dusty Attic...I love the blue print series of title's that they recently produced....you can see how I did the finish in the video above. Another fun little addition I've been adding to a lot of my tutorials lately is the use of Prills, these colorful cute lil pebbles. For this project I used a color appropriately named 'Ribbit' :) I believe Janene has these (Prills) available at her store at The Scrapbook Diaries as well....you can find them HERE. And how cute are these 'Feather Charm' chippies? The Dusty Attic designed a variety of styles in this chippie, this one I used is Feather Charm #3. 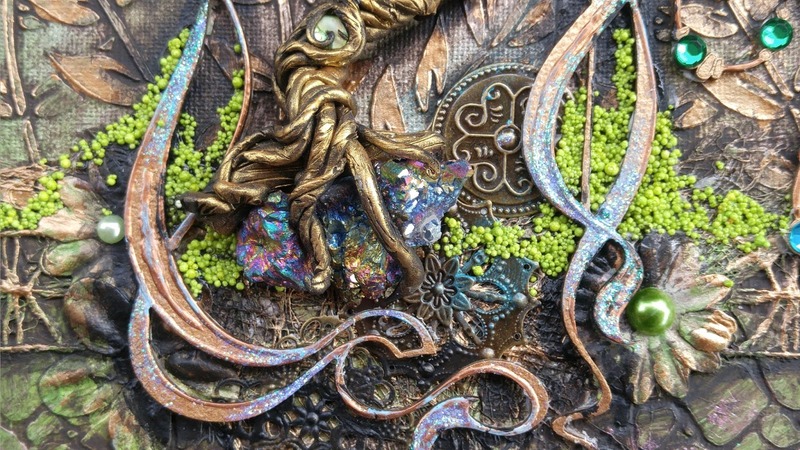 I sued a bit of 3D metalic paint on it to give it even more texture. 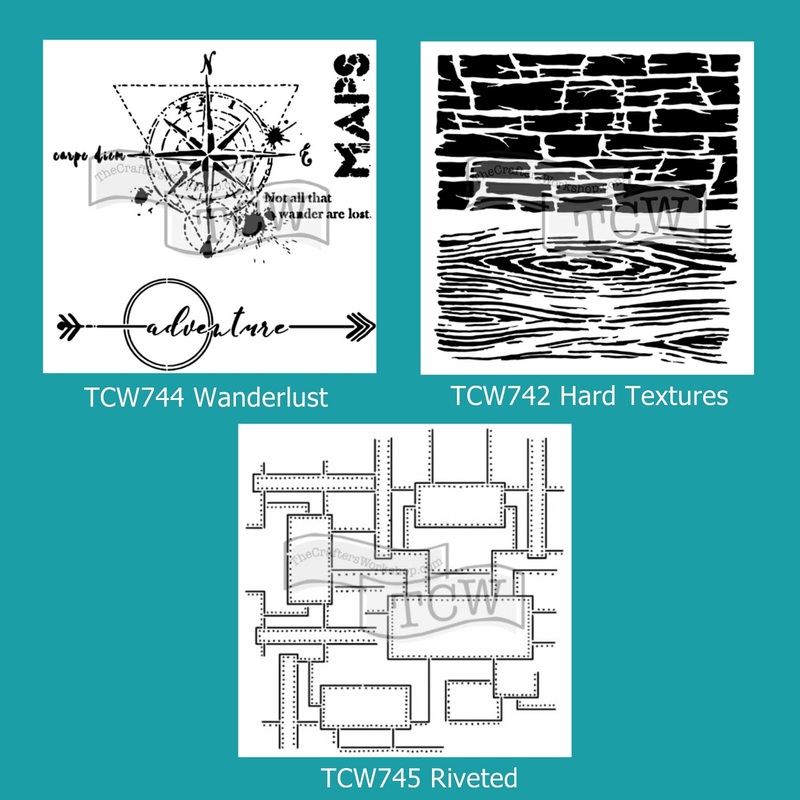 You can find TCW Stencils and Dusty Attic Chipboard at The Scrapbook Diaries (for those of you in USA and Canada), in Australia (or Internationally) you can order direct from The Dusty Attic website (for chipboard) and you can order both the TCW Stencils and Dusty Attic chipboard from The Mad Scrapper in the UK.The Stencils can also be found at Scrapbook.com and any craft stores that carry TCW products. Texture Paste Recipe - Do It Yourself!! Recycled Dryer Sheet Flower Tutorial!! PHOTOGRAPHY TIPS ~ How to get a good Photo of YOU! Faux Pearl Flourishes ~ How to make your own! Hi everyone! I'm a stay at home mom of two wonderful girls and am married to the love of my life Steve. 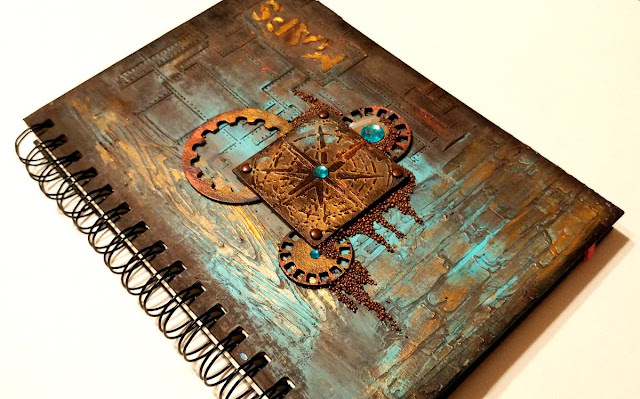 I started scrapbooking in 2006 when my sister introduced me to it and haven't looked back since! I would say my style is ever changing but if I were to name a style I'd say its 'shabby-chic/vintage'. 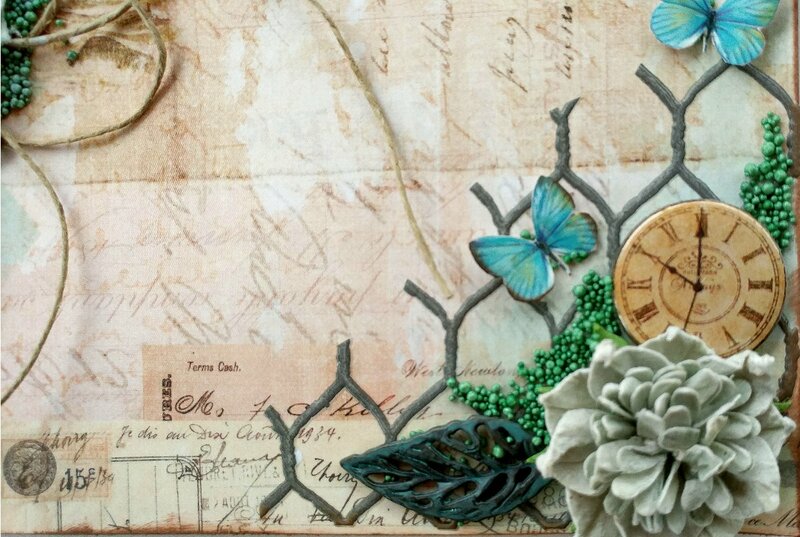 I've been published in Creating Keepsakes Magazine, Memory Makers Magazine and Scrapbooking & Beyond Magazine, Scrap365 Magazine, Canadian Scrapbooker and Australian Scrapbook Ideas Magazine along with a number of online Magazines. 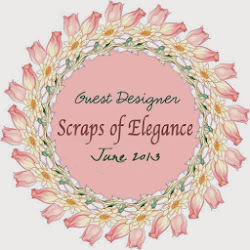 I have been on a number of Designs teams in the past including Daisy D's, Zva Creative, The Color Room and am presently on the Design Team for Bo Bunny, Webster's Pages and Dusty Attic, Maja Design and Scrap365 Magazine. This is my place to share what I'm working on and some new techniques and products I love. I'm on the Maja Design Team! 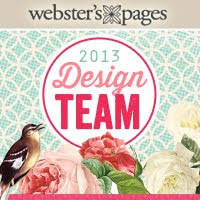 I'm a Design Team Member for Webster's Pages 2013 Team! New Magazine in the UK! !